With sandal season almost here, the time is right to review some effective ways to keep your feet looking neat this summer. But first, let’s take a moment to establish the “why” behind those less than lovely-looking heels. As we age, the moisture level of our skin decreases, which can lead to the heels drying out and becoming thick and rough. Then when we stand, run or walk, the the soft tissue under our heels expands due to our body weight and pushes out against the skin. When that skin is dry, instead of stretching under the pressure, it cracks. The result? Heels in need of some major TLC. After several years of virtually no growth, $2.9 billion body, hand, and foot care category experienced gains of 9% between 2012 – 2014 and produced some innovative new tools. 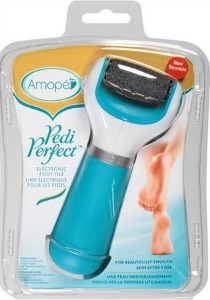 Amopé Pedi Perfect Electronic Foot File ($49.95) –Amopé™ means “love my feet” in Portuguese. Developed by foot care experts, the company offers only a select range of foot care and pedicure products. Sold in Walmart, Target and multiple drug stores, this one is easy to find and has a loyal following. The specially designed battery operated Micralumina™ roller head features microabrasive particles that deliver professional level results with minimal effort. It’s hard not to fall in love with this one! Gehwol Biosana Swiss File ($18) The file of choice at the Nordstrom Spa, this German file made in Switzerland is double-sided, abrasive-coated, antibacterial and waterproof. Start with the rough side to rub off the heavy callus and follow with the fine side to smooth the skin. It works best after soaking your feet or at the end of a shower. Of the three products profiled, this is the only one that can be used on wet skin. Unlike similar files, the grit is underneath a special coating so it never rubs off or dulls. Gehwol specializes in medically inspired foot care and was founded in 1868 by German pharmacist Eduard Gerlach. 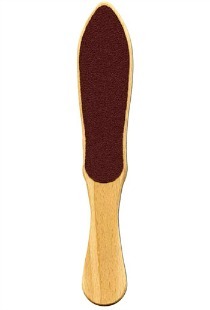 This is a great alternative to the metal “cheese-grater” style files that often don’t remove the skin smoothly. 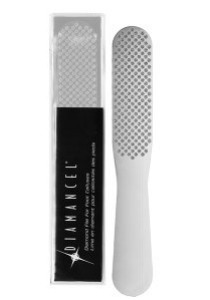 Diamancel Diamond File for Foot Calluses ($38) Frustrated with the lack of high-end manicure and pedicure tools, founder Ginette Godbout developed an innovative line of genuine diamond files for professionals and consumers. This ultra powerful file features a geometric diamond pattern to safely and effectively remove the toughest calluses without using a blade. The flexible, comfortable form helped establish Dimancel as the gold standard in spa-quality foot care. Check back soon as we will be continuing to explore the latest and greatest foot care and treatment products for all the sunny days ahead!